This new addition to the Maxwell’s menu is not for the faint-hearted (or the lactose intolerant). They’ve topped a 6oz beef patty with crispy bacon, shredded lettuce, red onion and special sauce, and then covered the whole lot in melted cheddar cheese. We’re not sure how you eat it but we’re willing to give it a go! 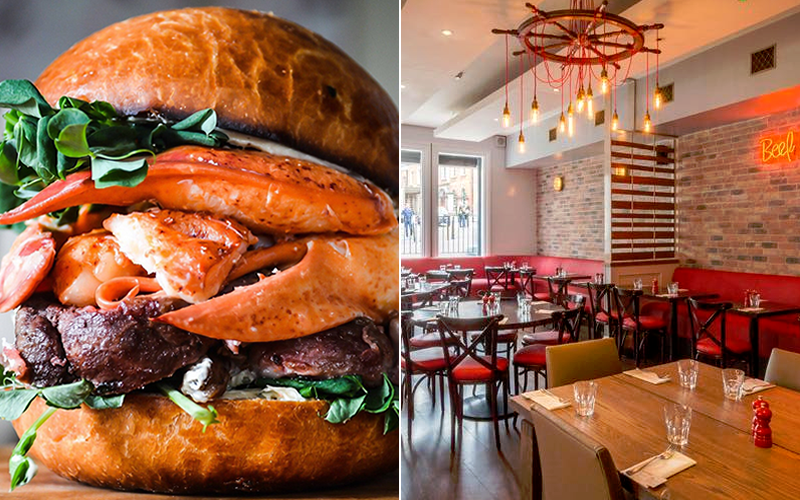 You’ll find this surf-and-turf stunner on the new brunch menu at Beef & Lobster in Temple Bar. Between the buns, there’s beef, lobster, B&L burger sauce, Dubliner vintage cheddar, and lemon and garlic butter. 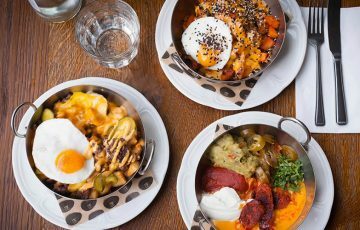 If you’re feeling extra indulgent, try one of their freakshakes or enjoy bottomless Bellini or Rossini cocktails for an extra €16. 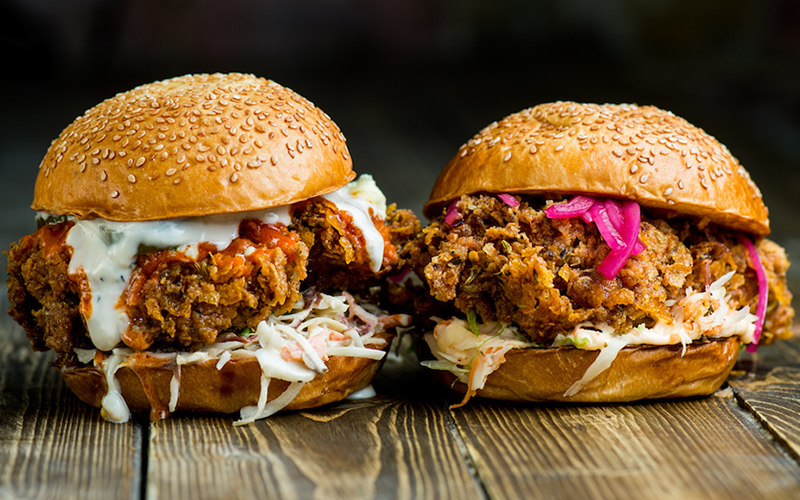 If you can resist the legendary Grizzly Bear burger, there are two knock-out chicken burgers to try at this Stoke Newington burger joint. Choose from the Buffalo Blue, which is drenched in blue cheese and buffalo sauce, or the Chix burger, topped with pickled red onion, jalapeño slaw, and Holy F*ck mayo. With a side of cheese fries and a few beers, it’s the perfect pick-me-up after a long week at work. 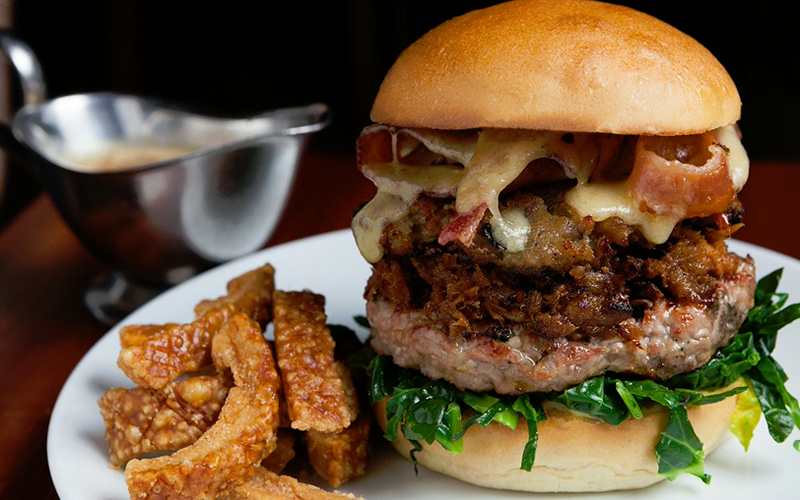 This all-pork burger is the latest addition to the bar menu at Hawksmoor in Covent Garden. It’s a Tamworth pork patty topped with pulled pork, sausage meat stuffing, smoked bacon, Ogleshield cheese, spring greens and mustard mayo. Quite the mouthful! 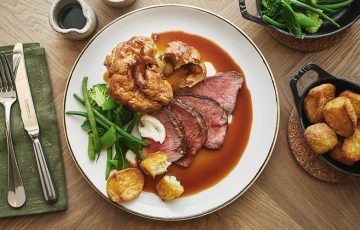 It comes with sausage gravy (for dipping), pork scratchings, and a choice of triple-cooked chips, beef dripping fries, or a salad – all for just £16. Wash it down with a Shaky Pete’s Ginger Brew or a cornflake milkshake. Need a break from beef? 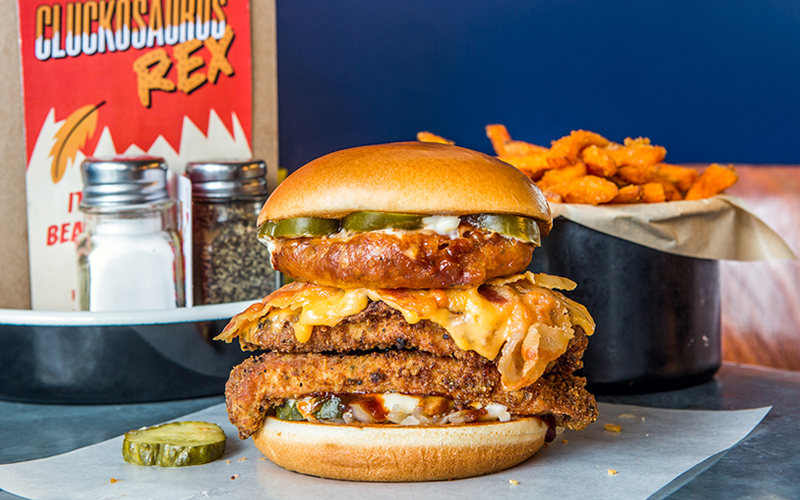 Head to Byron and try their epic new chicken burger, the Cluckosaurus Rex. They’ve taken a huge fried chicken breast and piled it high with American cheese, bacon, jalapeños, BBQ sauce, pickles, mayo, and a jumbo onion ring. 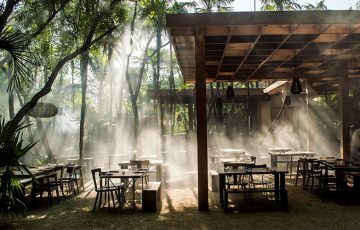 It’s on the menu until March 27th – don’t miss out! 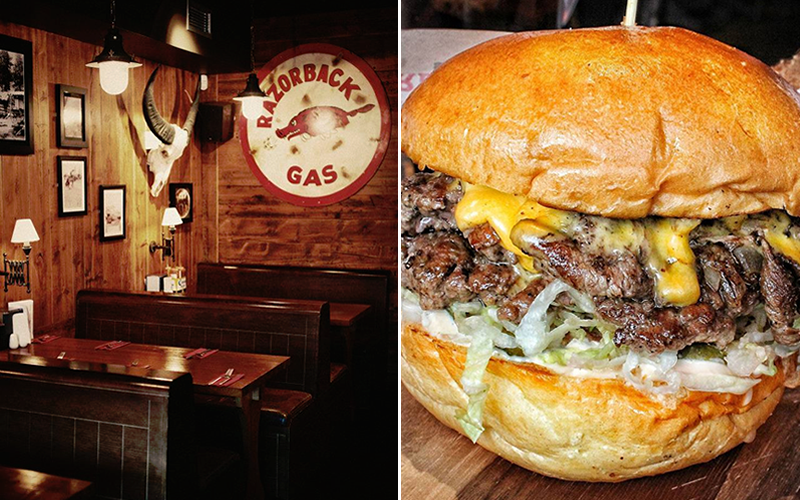 Get some mates together for a weekend feast at Red Dog Saloon, home to Kansas City ‘cue and some seriously epic burgers. 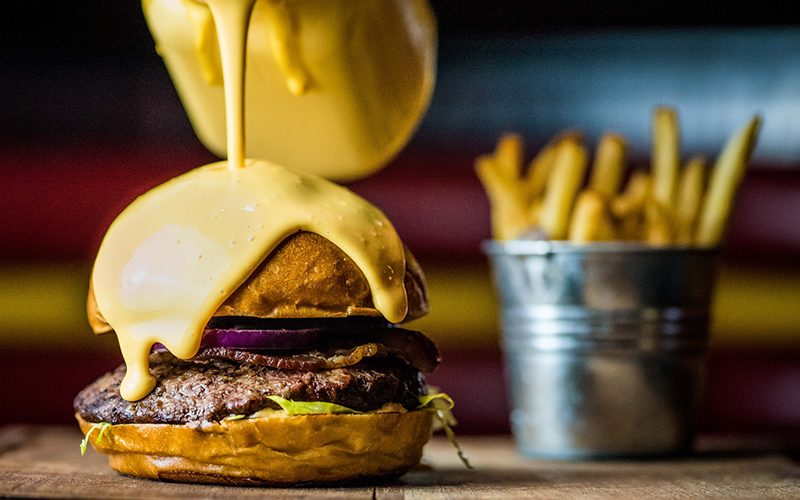 At their restaurants in Southampton and Nottingham, you can get stuck into the Philly Cheeseburger – their classic cheeseburger topped with wafer thin chuck steak, onions and American cheese. Meats sweats and good times guaranteed. Got an epic burger we should try? Let us know in the comments or via twitter. Le Bun’s double truffle burger! Oh yes! Such a decadent burger – especially with fries & truffle mayo on the side. The Bleecker Black. Best burger in town! At Bleecker Burger in Spitalfields or Victoria. They’re excellent!